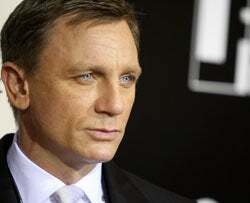 Isn't it weird how into Bond we've all gotten since Craig stepped into his hand-made shoes? At last night's Tribeca Film Institute's 2008 Fall Benefit Screening of the latest, Quantum of Solace, at AMC Lincoln Square, Daniel Craig channeled 007, Molly Sims channeled Glinda, and Julia Stiles channeled a potato sack. Indeed, in this star-studded assemblage — think Debra Messing, Becki Newton, Kelly Bensimon and more — for every Bond Girl-worthy frock was a total sartorial head-scratcher. The Good, the Bad... the quantum of solace (?) — after the jump! A tad Vegas, yes, but Kalpana Pandit looks so glam! Satsuki Mitchell was on Daniel Craig's arm all evening. Just sayin'. Julia Stiles proves that sometimes frumpy chic just ends up looking frumpy. As Kelly Bensimon shows, winter shorts are risky at the best of times, and shiny hose don't make things easier. Something about Debra Messing's ensemble looks awkward. When it comes to Liya Kebede (as Maury would say)...yeah, I have no idea.